Club Penguin Cheats by Mimo777 Club Penguin Cheats by Mimo777: Exclusive Items with Membership Cards! Club Penguin is getting ready to transform the island one crazy cool party! And members will be able to go into the VIP Backstage, where they can get the chance to meet Cadence! 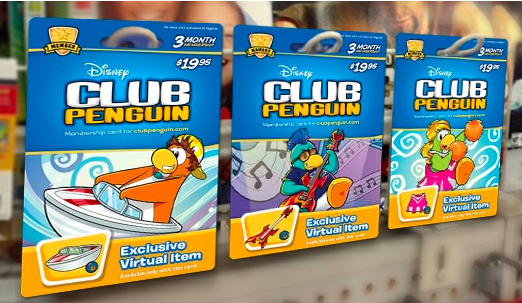 And in the United States, 3 month Membership Cards come with an exclusive item you can unlock online! There are three different cards that comes with a different free/ rare item. Such as: a speedboat, guitar, or cheerleader outfit. And CP and I want to know what you want to see come to the membership cards? Can u get these in the uk??? Hey Mimo.I just wanted to let you know that if you pause the Clubpenguin Video at exactly 0:55 (the video with cadence) you can see Herbert, and in his hand is a wrench. Does this mean Gary will have to assign us a new mission to save the party? It's all really cool stuff. Thanks for letting me have the opprotunity to post here. They don't sell them in Singapore... We can only get membership online... How am I going to get my free items? Help! have u seen the new screen log in? its the ultimate jam! There's a new start page and log in page. what does the speed boat do? I want to see a DBZ themed item. Like Super Saiyan hair for a penguin?